Do you ever just feel sort of grey? Like there's not much sparkle in your life? Sometimes, especially during the darker months, work seems to pile on, socializing feels like a chore rather than something to look forward to, and it feels like an extra effort to cook a delicious meal. My roommates can attest to the fact that I settle into a habit of having Tesco's finest Puy lentil and vine-ripened tomato soup for lunch everyday, with little variation. I get into a habit of hoarding my money instead of going out for meals. Food just gets a little boring. Hopefully I'm not alone here. I mean, I can't be the only one who gets into a food rut, can I? 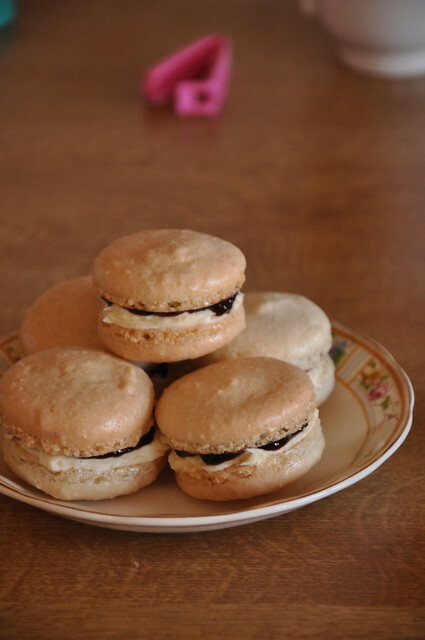 So, if any of you found yourselves nodding along, you need to get your hands on some ground almonds, get into the kitchen, and start making some macarons. 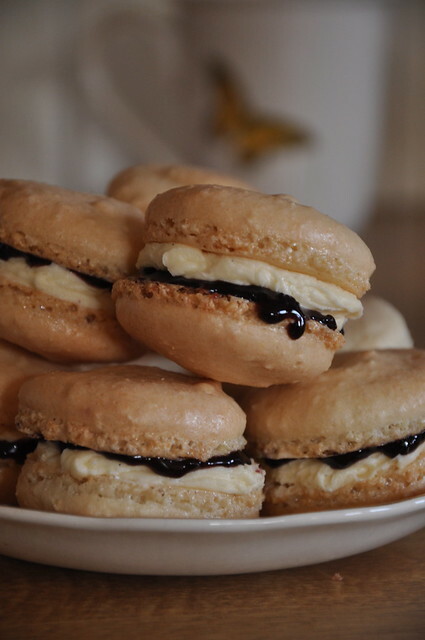 Nothing adds a bit of flair, a little sweetness to life than a light, lovely macaron. There is a reason that Laduree has become so popular. Sure, they have delicious macarons, but there is just something so glamorous about those teeny tiny adorable little cookies. 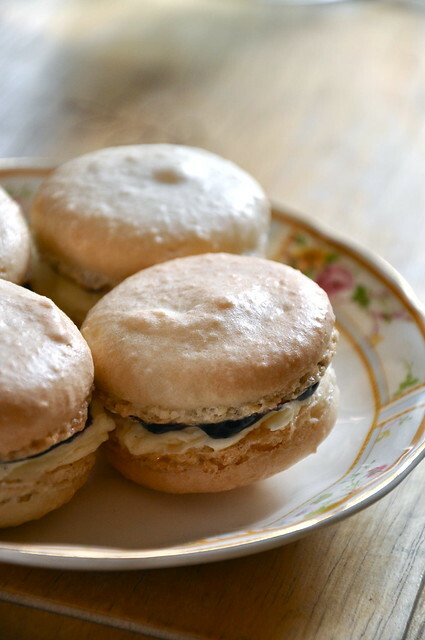 To make the macarons: Preheat oven to 175 degrees Celsius. Line two baking sheets with parchment paper. If you have a pastry bag, fit it with a 3/8-inch #4 tip. If not, cut the tip off of a corner of a small sandwich bag. In a small bowl, whisk together icing sugar and ground almonds. Using an electric mixer, whisk egg whites with salt on medium speed until foamy. Increasing the speed to high, slowly add caster sugar and continue to whisk until stiff peaks form. Gently fold in almond mixture until just incorporated. To make the buttercream: Cream butter using an electric mixer until light and fluffy. Add icing sugar and beat, starting at a low speed, and gradually increase speed until icing sugar is completely incorporated. Beat in milk, vanilla beans, and vanilla extract. 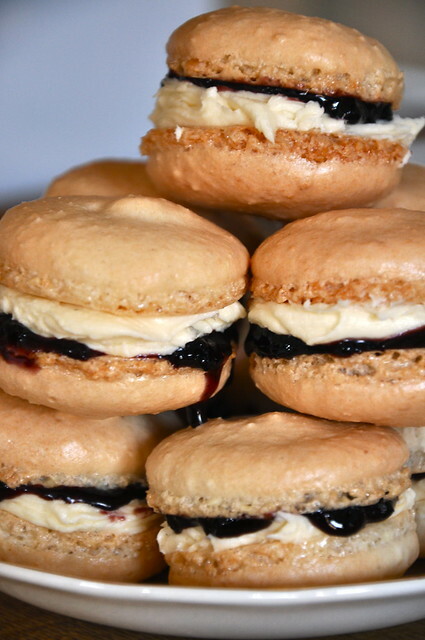 To assemble the macarons: Spread buttercream onto half of the cookies. Spread jam onto the other half. Sandwich together the halves with buttercream and those with jam. Refrigerate for an hour, until firm. 3. I took a macaroni baking class and have been to afraid to try myself at home. This post gives me some confidence to venture forward.